Citation Information: J Clin Invest. 2018;128(11):4898-4911. https://doi.org/10.1172/JCI98353. 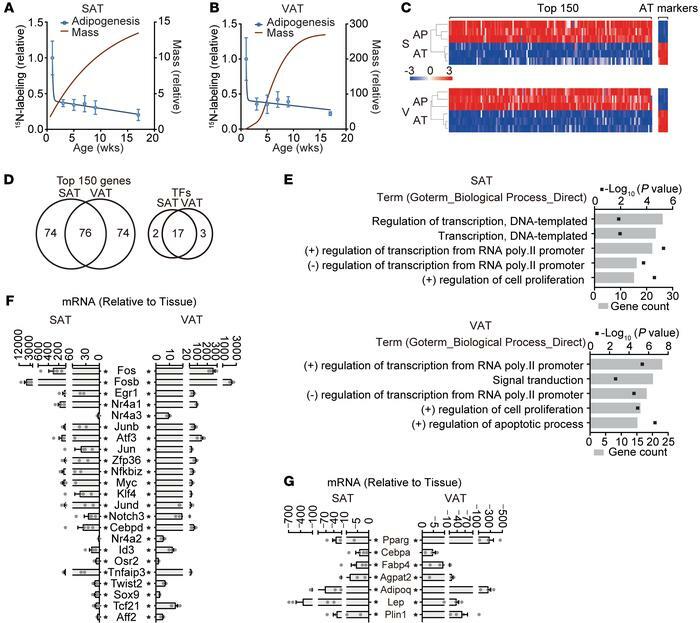 Identification of candidate transcriptional regulators of AP function. (A and B) Relative adipogenesis measured as a function of postnatal age. 15N-thymidine administered for 2 weeks to mice of various ages ranging from less than 24 hours old to 15 weeks old. 15N-label in the adipocyte fraction, indicative of proliferating and differentiating APs, was measured by IRMS. Relative mass provided as reference in red (see also Supplemental Figure 1, A and B). Data expressed as mean ± SEM. n = 4–11 mice per time point. (C) Microarray analyses of freshly isolated AP-rich stromal vascular fractions (see also Supplemental Figure 1C) relative to whole AT from the same mice (n = 3 mice). Heatmap representation of top 150 upregulated AP genes and 7 representative adipocyte markers in subcutaneous (S) and visceral (V) depots. (D) Left: Venn diagram of the overlap of the top 150 genes between AT depots. Right: TF fraction of the top 150 genes. (E) Top 5 GO terms for biological processes of differently expressed genes annotated by DAVID. (F) Real-time qPCR of freshly isolated APs, inclusive of the 22 TFs in C and expressed relative to unfractionated AT. (G) Relative expression of terminal adipocyte markers in APs relative to unfractionated AT. (F and G) Data displayed as bar graphs ± SEM, with dots showing individual values; n = 4 mice. *P < 0.05, 2-tailed, unpaired t test (pass Shapiro-Wilk normality test) and Mann-Whitney U test (values are not from Gaussian distribution).